Oh hello again. Yesterday afternoon I asked Twitter what I should write a blog about to get back on my blogging megahorse, and I received lots of excellent suggestions. Yesterday's came from @LollyGee and today's is from @betsymartian. If you're on Twitter and not following both of these people then you're no friend of mine, let me tell you. I live by the sea near the border between East and West Sussex. Prime panda country. Every autumn, the majestic and sweeping panda migrations make parts of Southwick, Shoreham-by-Sea and Steyning completely impassable. Alas, occasionally one will wander off from the herd. Then what do you do? Well, the first thing is not to panic. They're not actually more scared of you than you are of them. In fact they will gladly bite your face clean off. However, what you need to do is forget that fact for a minute and get some courage. Because a faint heart never got a panda in a headlock yet. That's right. 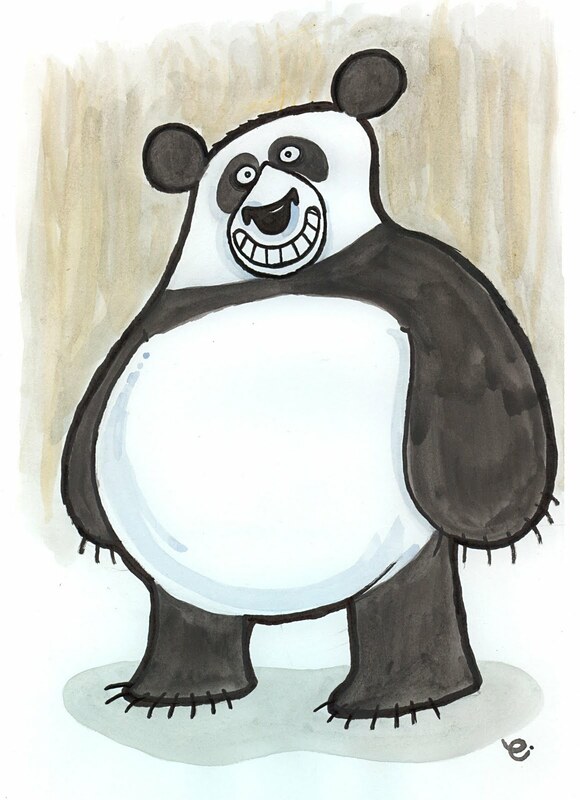 Pandas love to eat bamboo and they don't like lady pandas (or mandas, if they are a lady panda). There's nothing a panda would rather do than eat bamboo all day on their own and do nothing about making any new pandas. So, to capture a panda is a three man operation. (WARNING: one of these three men is going to complain bitterly about having more to do than the others. Ignore them). The first must dress as a lady panda (or a manda, if you have a lady panda to deal with) and just sit there looking coy and flirtatious. The second must dig a 10 foot by 10 foot by 10 foot deep pit and fill it with bamboo. The panda will see the lady panda (or manda) and go, 'uh oh. Don't want to be accidentally be doing any baby pandas'. Corralled by that horrible thought it will gallop into the bamboo pit. Where the second will probably still be stood, sweating and swearing about how unfair it all is. The third's role is to film all of this and send it to me at the email address in the sidebar. Thanks.